The TallyGenicom 6805 enclosed pedestal printer prints up to 500 line per minute. Designed to have a compact footprint, the TallyGenicom 6805 enclosed pedestal printer comes loaded with the same built-in quality and performance of the top-of-the-line TallyGenicom 6805 enclosed pedestal printer. It is designed for customers seeking a quiet, versatile, dependablepedestal-style printer for use in an office with space limitations. The Enclosed Pedestal is easily moved to any space in your office on its industrial strength casters. The user can easily reach over the pedestal and collect a form from the adjustable rear tray, or walk around to access larger print runs from the lower tray. Like all the printers in the 6800 family, the Enclosed Pedestal is ENERGY STAR qualified and is ready to plug into your network and start printing from day one. The TallyGenicom 6805 enclosed pedestal printer delivers flexible design, adaptable functionality and quite operation at an affordable price. With the TallyGenicom 6805 enclosed pedestal printer, you receive the benefits of a cabinet printer in a smaller footprint. Ideal printer for office environments where noise and space constraints are important considerations. Industrial strength casters allow you to move the printer within your facility. Convenient tray location improves productivity and customer satisfaction. New modular enclosures improve reliability and occupy a smaller footprint while delivering location and installation flexibility. New sheet metal promotes increased durability and quieter acoustics. New kit assembly and configuration offers price-competitive design. Adaptable Functionality. 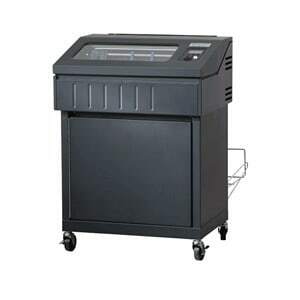 The 6805 Enclosed Pedestal Printer adapts to almost any supply-chain or back-office environment. More models to fit your unique requirements including the open pedestal, enclosed pedestal, quiet cabinet and new tabletop model. PowerPrint™ delivers improved print clarity and print darkness on multi-part forms by increasing impact energy. PowerPrint is a standard feature on 6805 printers with a 1,000 line-per- minute print speed. Manageable Savings. The 6805 Cartridge is a smart purchase. New backward-compatible cartridge ribbon reduces inventory management cost and eliminates ordering and installation confusion. New remote diagnostics let you monitor functionality anywhere. New energy efficiency technology lowers idle power consumption by 55% and boosts operating efficiency.